In 2014, Scotland will hold a referendum on whether or not to end the union with England. Artists have always played a role in national movements, so will they vote yes or no? The Centre of Contemporary Arts is among Glasgow’s most popular venues. Earlier this week, a fashionable crowd of artists and “creatives” gathered at the center not to watch a band or to see the latest exhibition. They came instead to listen to a debate about what is fast becoming this season’s hottest topic among Scottish artists: independence. In September 2014, Scotland will go to the polls in a referendum on whether or not to leave the United Kingdom. The Scottish National Party, which control the devolved parliament in Edinburgh, have spearheaded the drive for an independence vote and the country’s artists have been a vocal presence at the heart of the national conversation about whether Scotland should go it alone. Polls suggest that around a third of Scots are in favor of independence currently, but support seems higher among Scotland’s creative community. Famous writers, poets and visual artists such as Liz Lochead, James Kelman and James Robertson have all come out in support of a ‘yes’ vote. “I think there are a lot of people in the arts who are pro-independence,” Stuart Braithwaite, founder of Scottish post-rock group Mogwai told the audience at the CCA debate, which was organized and facilitated by Scottish social media platform Kiltr. 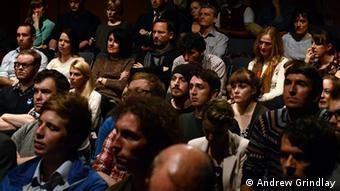 Artists often play a role in national movements but will independence lead to less money? Mr Braithwaite has been a prominent voice in favor of independence, particularly on Twitter where he goes by the handle @plasmatron. During the hour-long discussion he explained why so many artists are backing the independence cause. “I’ve a theory about why that is. When you make art you are willing to go into the unknown. Independence is going to be a leap of faith,” the musician said. At the debate though, speaking in favour of a “no” vote next year, Mark Hogarth, creative director at the clothing brand Harris Tweed Hebrides, said it would be “stupid” for anyone to try to politicise the artistic movement in Scotland. Mr Hogarth criticised the assumption that Scotland’s creative community is united behind independence. “There are artists and other individuals out there who have maybe not come to a conclusion yet. Perhaps the fact they have not been quite as voluminous as the independence campaign is no representation of how the artistic community actually lies,” he said. “We would not wish our festival to be anything other than it has always been, which is a politically neutral space for artists. It is important that it remains that,” Mills said in an interview with a Scottish newspaper at the time. “I don’t think the EIF is going to be able to keep this issue out. 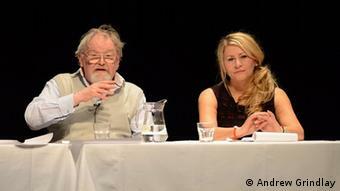 We’ve got a year to make use of this opportunity to start a proper discussion,” novelist Denise Mina said at the time. 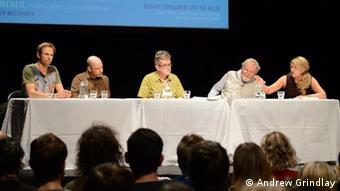 The four-person panel at the CCA debate in Glasgow featured another person whose views on Scotland’s constitutional destiny have grabbed headlines: writer and illustrator Alasdair Gray. In an essay entitled “Settlers and Colonists” published late last year, Mr Gray suggested that since the 1970s, English men and women have been over-represented in the upper echelons of Scottish life, in “electricity, water supply, property development, universities, local civil services” and in the arts. The avuncular, white-haired Gray was a firm favorite with the audience in Glasgow, even if not everyone agreed with his suggestion that culturally Scotland punches below its weight compared with similar sized countries such as Ireland. That eco-system is well represented in Glasgow. The city’s recent cultural regeneration has been so successful that renowned art curator Hans Ulrich Obrist has dubbed it “The Glasgow Miracle.” Some in the “No” camp have warned that a vote for independence could jeopardize Scotland’s artistic achievements thus far; perhaps fearing that there would not be as much money around to achieve these kinds of “miracles” in an independent Scotland. “Independence will bring nothing to the arts,” says Pauline McNeil former shadow minister for culture in the devolved Scottish parliament and an advocate of retaining the status quo at the CCA debate. 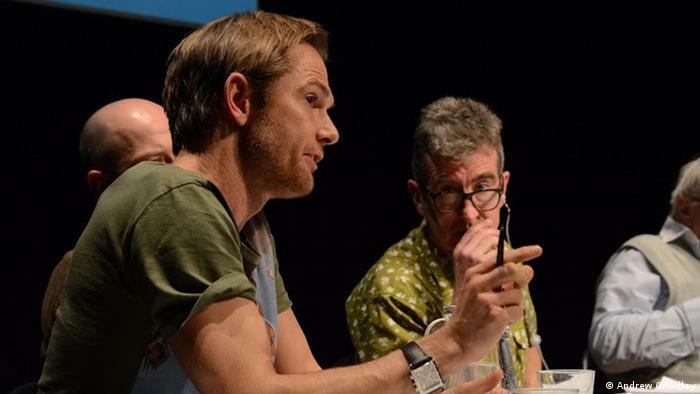 All in all, judging by the reaction at the close of the debate – the two ‘yes’ voices received the biggest cheers of the night – many in Scotland’s artistic community are still backing independence. But there is a long way to go between now and polling day on 18 September 2014.